Physical activity is vital to a child’s healthy development and helps with confidence, strength, motor skills, sleep, stress, obesity, behavioural issues and more. As many young children attend an early childhood service for a large portion of the day, it’s important that all early childhood educators are aware of how much exercise children receive under their watch. But how do you know how much physical activity is enough for each age group? We look at the current Australian guidelines for infants and young children, and have some helpful tips for boosting activity levels in your service. Infants (birth to one year): Physical activity particularly through supervised interactive floor-based play in safe environments should be encouraged from birth. For those not yet mobile, 30 minutes of tummy time including reaching and grasping, pushing and pulling, and crawling spread throughout the day during awake periods is encouraged. Toddlers (1 to 2 years): At least 180 minutes a day doing a variety of physical activities including energetic play such as running, jumping and twirling spread throughout the day – more is better. Pre-schoolers (3 to 5 years): At least 180 minutes a day in a variety of physical activities, of which 60 minutes is energetic play such as running, jumping, kicking and throwing spread throughout the day – more is better. Children 5-12 years: At least 60 minutes of moderate to vigorous intensity physical activity every day including a variety of aerobic activities. 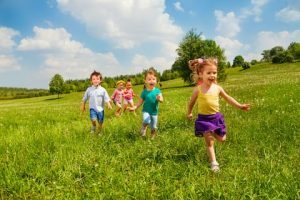 At least three days a week, children should engage in activities that strengthen muscle and bone; and for additional health benefits children should do more than one activity up to several hours per day. Baby tummy time: Make sure they’re awake and alert when you do tummy time, such as after a nappy change or sleep. And encourage them to move by placing different toys around them in a circle. Plan the activities: Make time for both structured/teacher-led activity and free play. Opt for outdoor play as much as possible, but also find an indoor space they can be active in. Think outside the square: Throw a dance party, make an obstacle course, have children act out a story while you read it or get them to move when transitioning like hopping, skipping or jumping to another location. Try external locations and staff: Visit safe local facilities such as parks or karate studios or if budget allows invite fitness experts in to run regular movement classes such as kids’ yoga. Include active games: Such as follow the leader, musical statues or a jumping activity. Be a role model: Even if you’re not fit yourself, get involved in the physical activity or game, as children will be more inclined to join in when they see you moving and having fun too.